I didn't do any sketches over the weekend because I was REALLY busy doing color work for my "The Power Within" comic, which is coming up on its deadline for ComiCon! 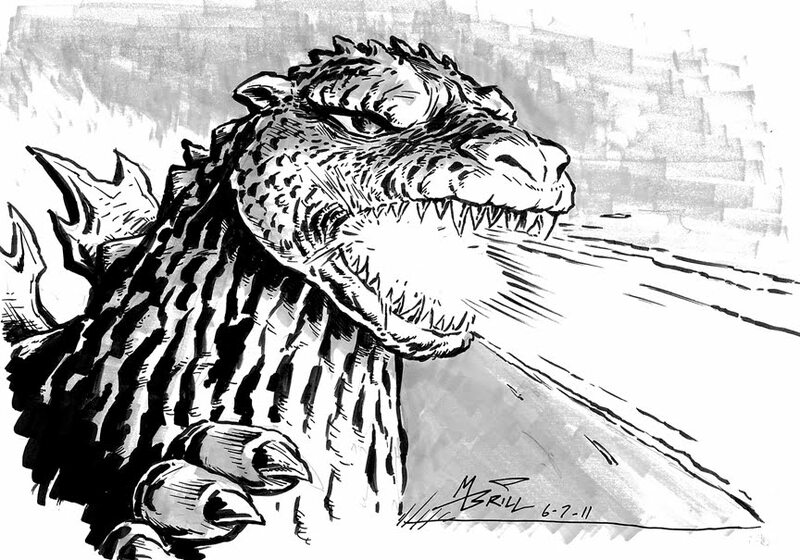 However, at about midnight Saturday night as I slaved away over a hot Wacom tablet, I selected a couple of Godzilla movies from my On-Demand menu and had those going in the background. It was fun to see them, even though I couldn't give them my whole attention...but it made me harken back to a time, when I was 10 or so and living in Grand Prairie, TX when my buddies and I used to hike to the local cinema and watch rubber monsters do loud and destructive battle on the silver screen! Anyway, so I was inspired to do this one today--about 20 minutes, so pretty good time.